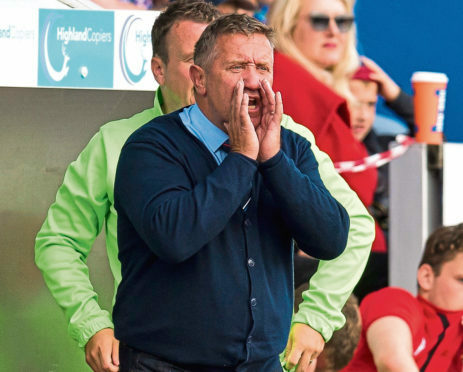 Caley Thistle manager John Robertson says Inverness’ 17-match unbeaten streak in the league has been built on a determination to dig out Championship points. Inverness have not lost in the league since a 1-0 loss at Dunfermline on March 13, and host Queen of the South at Caledonian Stadium today. Robertson believes his side had to show battling qualities, as well as attacking flair, in order to keep the run going, and he said: “As a manager, 80% or 90% of your wins are fights to the end. “It’s dog-eat-dog, very tight and takes a bit of magic or luck to win the games. “You only get about 10% of your games – if you are lucky – where you can sit back with five or 10 minutes to go and say the game is safe. “We are saying to the players to win the match first and foremost and then we will analyse that performance. “That’s what you do. But the most important thing as any manager will tell you is to get the three points on the board. “Any club that goes on any type of run is exactly the same. “You can look at Hearts in the Premiership at the moment, and they have not won all their games by blowing the opposition away. “They have won three or four games like that, but most of their games have been 1-0 wins. There may be a dominant 1-0 in that, or a lucky 1-0 in that. “Nobody cares, because all you see at the end of it is three points. That’s the first thing. Caley Jags are a point adrift of leaders Ayr United however Robertson, who has attacker Nathan Austin back from concussion for today’s visit of the Doonhamers, is refusing to get carried away. He added: “It is all about a winning mentality. We have a squad here we feel has good players and we’ve shown some good form so far.